Tushar is a rising junior at Neuqua Valley High School in Naperville, Illinois. He not only likes to compete in math contests, but looks forward to the Frisbee games that accompany these competitions. He has lived his entire life in Naperville, but has traveled across all the continents, except Antarctica. At school, he is a part of the math team, speech team, student council, and the iSTEM club. He is a keen researcher, and in addition to math, he is very interested in the biological sciences. 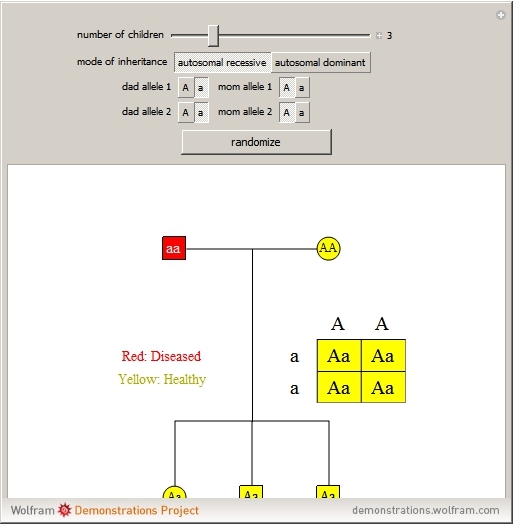 This Demonstration allows the user to manipulate the genotypes of the first-generation parents. Based on the genotypes, a Punnett square is output, displaying all possible genotypes for the second-generation children. A two-generation pedigree is also output, with the genders of the children decided randomly, and the genotypes assigned using a weighted probability based on the parents' genotypes. Depending on the mode of inheritance selected—autosomal dominant or recessive—a disease phenotype is associated with a genotype that carries negative alleles.